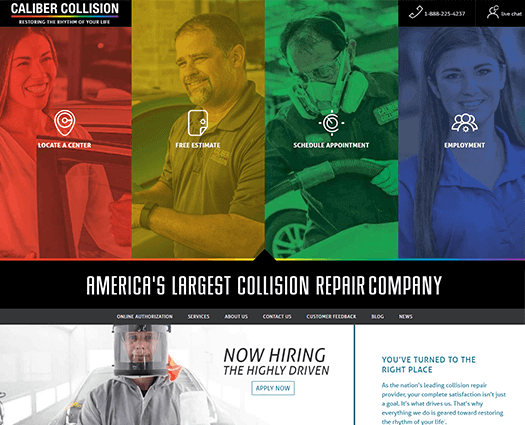 Caliber Collision, the nation’s largest collision repair company, came to us looking for a leading company to help with their PPC campaigns. They wanted an agency that was going to always be thinking about their business, always presenting them time-tested best practices, and bring them new opportunities that met and exceeded their online marketing goals. They weren’t just looking for a “doer”, but a “partner”. 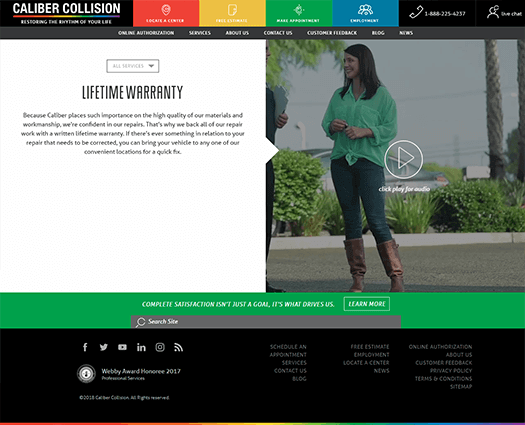 Caliber Collision came to us with extremely aggressive growth goals. Their business was expanding and they needed experts that could help them become a market leader. Their digital partner had to be able to recommend best-in-class strategies and tactics to launch paid search campaigns across hundreds of markets and provide on-going recommendations, management, and optimization of these campaigns. But most importantly, it had to be done profitably! Our team quickly analyzed and researched the auto body repair market from two main standpoints – the national level and local level. To be able to compete nationally with the other large brands, we needed to develop a campaign that would increase traffic and impressions but also ensure that the traffic converted profitably. Based on our research, a strategy included geo-targeting, paid ads and retargeting – both from the state and national level were developed. Due to the nature of the collision industry we learned that a large portion of their leads happened via phone calls to the local centers. We worked closely with the client to develop a call tracking solution to be able to tie back phone calls to their individual keywords. A large amount of testing and learning was carried out to the point where we have built up the account to over 130 campaigns and well over 10k keywords being managed. Data based on YOY results. We’ve been growing businesses since 2009, let us do it for you! Stay tuned with us on social networks! © 2019 HigherVisibility · A leading digital marketing agency.